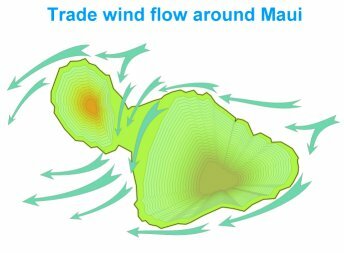 Maui winds are a combination of prevailing winds, trades, konas and storms, combined with local wind effects caused by Maui’s geography. The wind on Maui will be very specific to different areas. The wind on one side of the island can be blowing in the opposite direction from the wind on the other side. Depending on the activity you have planned, you may be seeking out the windiest spot, or trying to shelter from the wind for a surf session or picnic. 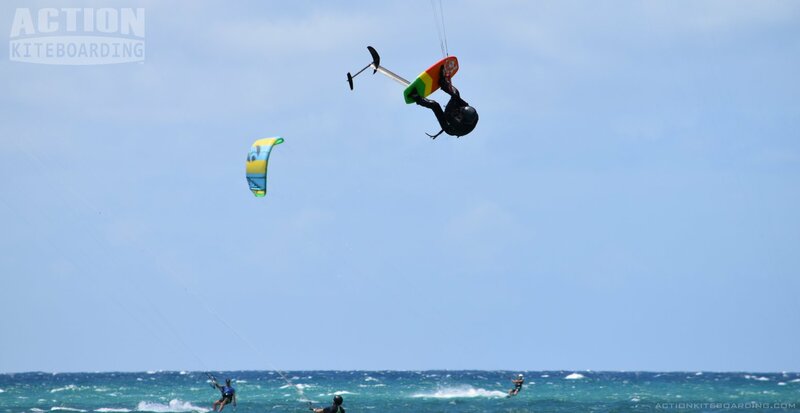 Check out the Current Wind Forecast for North Shore Maui. For safety reasons you should always be aware of: extreme weather, severe weather, and any marine warnings. Check the weather reports before going to the beach, so you will have a good idea what to expect when you get there. On this page we have brought together most of the information that is useful to check the weather everyday. Click here for a general description of the monthly averages that will give you an overview of seasonal variations. On this Maui Wind page we have: wind information, wind patterns, Local Wind effects. Links to: moon phase, tide times, the current Weather map for the Northern pacific, and some global weather data. We also have some descriptions of local weather patterns. See our Surf Report page for more info on: Surf Forecasts, Wave heights, swell maps, tidal info and much more. Once you get up the accurate wind picture, you will have a better understanding, and and expectation of the conditions you will encounter at the beach. May your ocean experience be a safe and enjoyable one. What is a convection Wind? A convection wind is caused by uneven heating of the earth’s surface. A “seabreeze” is an example of a convection wind effect, when the land heats faster than the ocean, and the air above the land is heated and subsequently rises and creates a low pressure over the land, Then the cooler air over the water descends and flows toward the land. Seabreeze causes the wind to blow toward the land. Sea Breeze: The sea breeze is a local wind where the land heats faster than the ocean, creating a temperature differential. The uneven heating of the surface in turn affects the temperature and dynamics of the air. The sea breeze effect is strongest in the middle of the day, and lessens at dusk and dawn. The sea breeze effect can reverse at night to become a night breeze or land breeze. Surface Pressure: The rising air causes a low pressure area at the surface. The cooler air descending causes a high pressure to form. At the surface the air moves from a high towards a low. 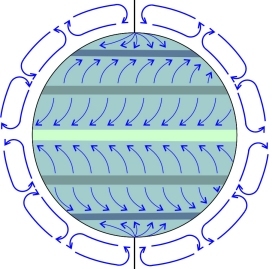 This creates the horizontal air flow, which is wind. Because the earth is a sphere, Incoming Sunlight hits the surface at the equatorial regions more directly, and the polar regions at a low indirect angle. This causes the equator to heat more than the poles. The hotter surface at the equator heats the air above it. The Hot air rises and moves outward towards the poles. The cooler polar air descends and moves towards the equator along the surface. This creates surface winds. This atmospheric circulation is the convection cycle. The Rising and falling air form a series of smaller cells that create wind bands. The areas where the air is rising or falling have no wind. The area between the rising or falling air will have horizontal air flow (wind). The surface winds are deflected to the west by the Coriolis force as they move across the surface. The Coriolis force is a result of the earths rotation. The Equatorial Low at the Equator has no wind, this area is also known as the Doldrums or the ITCZ (Inter-Tropical Convergence Zone). 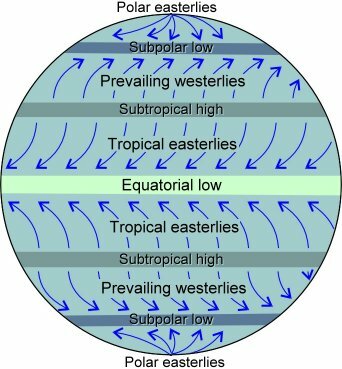 The areas north and south of the equatorial Low are the tradewind zones with the Tropical Easterlies. Tradewinds in the northern hemisphere blow from the North-East, Tradewinds in the southern hemisphere blow from the South-East. Hawaii is located in the tradewind zone in the northern hemisphere. So winds are generally from the Northeast. The bands of wind shift slightly north in the summer and south in the winter. What are Tradewinds? : In summer the trade wind weather predominates. Trades blow from the NE to ENE direction and provide the comfortable climate and wind powered activities that we enjoy here in the islands. In summer 9 out of 10 days have trade winds. Trades usually bring fair weather to the central valley and south side of the island. But trades do bring regular showers to the windward sides of all the islands and on Maui especially toward Hana, Haiku and upcountry. We do have the rainforests and waterfalls to prove it. Showers are especially frequent in overnight and in the mornings. There may be spells of lighter winds but Hawaii has a high number of windy days. What are Kona Winds? : Kona winds are often accompanied by rain and thunderstorms. Hawaii experiences about three Kona storms per year. It is possible to windsurf and kite in these southerly Kona wind conditions but it is definitely not recommended during the intense parts of any storms. Kona storms can produce heavy rains, flooding, waves and storm surge. Localized flooding can cause flash floods, which are extremely dangerous to people and vehicles. Wind Effects: What are wind effects?. Wind effects are the interaction of the wind and the surfaces that it passes over. Mountains will block or bend the wind, bays will spread the wind and valleys can squeeze the wind. Wind is forced to go up over and around. The wind is altered by these interactions, whether temporarily or permanently. Understanding the wind effects will give you a better understanding of the actual wind in a specific area. Wind Shadow: Wind shadows occur on the downwind side of any object. the wind is blocked by the object and creates an area of little or no wind on the downwind side. The mountains on Maui create huge shadows that protect the leeward sides from the tradewinds. The wind in the shadows can be turbulent or even the reverse direction from the prevailing wind. Valley Island Venturi: Maui is called the valley island, because its twin volcanoes have created a valley that runs NE to SW. This large valley acts as a funnel to concentrate the trade winds making them stronger. Maui’s valley is a natural wind tunnel that makes it the windiest Hawaiian island. There are also venturi effects between the islands where the wind is forced to squeeze into a narrow channel. The Maalaea Bay on the south shore experiences the Bay effect. The Bay Effect is where the wind spreads out and reduces its speed and diverges outward in its direction. During a Kona wind the Kahului Bay experiences the same effect. Wind Shadows: On Maui there are two large areas on Maui that experience wind shadows. The Lahaina area, and the westside are usually protected from the tradewinds, and the Wailea – Makena area on the south side. Tropical Storms: Depending on its location and strength, a tropical cyclone is referred to by many other names, such as hurricane, typhoon, tropical storm, cyclonic storm, tropical depression, and simply cyclone. While tropical cyclones can produce extremely powerful winds and torrential rain, they are also able to produce high waves and damaging storm surge as well as spawning tornadoes. This is the reason coastal regions can receive significant damage from a tropical cyclone, while inland regions are relatively safe from receiving strong winds. Heavy rains, however, can produce significant flooding. What is the weather like in the winter (December, January, February)? Winter is our rainy season, but that doesn’t mean it rains all the time everywhere. Rather it is a time that the weather can be more unsettled and changeable as storm systems and cold fronts extend far enough south in the Pacific to impact Hawaii. When one of these weather systems affects island weather, it usually means several days with lighter winds, increased humidity and cloudiness with showers and heavier thunderstorms possible. It is unusual for any rain to last more than a few hours, so even on the wetter days, the sun usually shines. Still, about 50% of the time, normal tradewind weather dominates, which means a nice breeze with lots of sun and a few mainly brief and light showers, especially along east sides of the islands and near the mountains. Daytime temperatures are usually in the upper 70s with lows in the mid to upper 60s at lower elevations. After a cold front, it is possible for temperatures to dip into the 50s at night and only reach the low 70s during the day. If you go to the higher elevations on Maui and the Big Island, be prepared for cold temperatures and even snow. Temperatures above 10,000 feet will only reach the 40s during the day and 20s at night. At elevations above 12,000 feet it is normal for there to be several inches to feet of snow on the ground most days during the winter as those storm systems produce heavy snowfall at the summits. Those same storm systems are also responsible for frequent large surf along north and west sides of most islands. Surf higher than 25 feet occur many times each winter. What is the weather like during spring (March, April, May)? March is still considered to be part of our winter rainy season, but by April, patterns begin to change from the unsettled winter weather to more typical tradewind weather. Still, on average during the spring, about 60-70% of the time we experience tradewind weather. This means a nice breeze with lots of sun and a few mainly brief and light showers, especially along east sides of the islands and near the mountains. Most years, especially in March through early April, some of the tradewinds may become quite strong and blow at speeds of 30 mph and higher for a few days at a time. Daytime temperatures by May are usually in the lower to mid 80s with overnight lows in the upper 60s to lower 70s. If you go to the higher elevations on Maui and the Big Island, be prepared for cold temperatures. Temperatures above 10,000 feet will only reach the 40s to near 50 during the day and drop into the 20s at night. At elevations above 12,000 feet it is still possible for snow to occur, even into early May. Large surf episodes can still occur, especially in March. What is the weather like during the summer (June, July, August)? Summer weather is highlighted by the persistent tradewinds which occur about 90% of the time. These winds blowing from the northeast provide a cooling breeze accompanied by the occasional shower. The showers that occur tend to be brief and light in nature and confined to the windward, or east, sides of the islands and near the mountains. Daytime temperatures reach well into the 80s and even the lower 90s in some locations, especially the drier leeward sides. Overnight low temperatures are in the 70s. At higher elevations, such as Haleakala on Maui and Mauna Kea and Mauna Loa on the Big Island, temperatures are much cooler. Daytime highs will be in the 50s and 60s, with overnight lows in the 30s and 40s. During the 10% or so of the time that the tradewinds weaken, it can become rather humid. Hurricane season also begins in June, although it is not until late July and into August that the chances of a tropical system somewhere within the Central Pacific begin to really increase. On average, about 4 to 5 tropical systems occur each year within 1500 miles or so of Hawaii. The vast majority of the time, the storms stay far enough away that no impact is noted in Hawaii. The last time a tropical storm or hurricane came close enough to Hawaii was Jimena in 2003. It did not have a significant impact on the state. Summer is also the peak of our South Shore Surf Season. Large winter storms thousands of miles away in the south Pacific send swells toward Hawaii every week or so. Due to the large distance the swells have to travel, about the largest surf we experience along the south side of islands is 10 to 15 feet. What is the weather like during the fall (September, October, November)? These months are a transition time between the steady tradewind weather of summer and more unsettled weather during the winter. This is still hurricane season for the Central Pacific and Hawaii. On average, about 4 to 5 tropical systems occur each year within 1500 miles or so of Hawaii. The vast majority of the time, the storms stay far enough away that no impact is noted in Hawaii. The last time a tropical storm or hurricane came close enough to Hawaii was Jimena in 2003. It did not have a significant impact on the state. Typically the threat for tropical systems begins to quickly diminish by early October, however during El Nino periods, the threat can continue well into November. 1982 was a prime example, with Hurricane Iwa impacting Hawaii around Thanksgiving time. 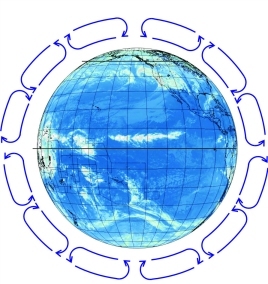 Tradewind weather is still the norm, occurring about 70% of the time but this pattern begins to fail more often during October and November as early winter storms in the North Pacific start reaching farther south. When the tradewinds fail, usually for 2 to 3 days at a time, it can become very humid. The threat for heavy showers and thunderstorms are also quite high during these brief periods. In fact, more flash flooding occurs during October than any other month. Still, the majority of the time the weather is dominated by tradewinds, meaning generally sunny conditions with brief light showers typically occurring along windward (east) sides of the islands as well as near the mountains. Daytime temperatures at low elevations during September into early October are still in the upper 80s to low 90s at times, but by November, highs are typically more in the mid 80s. Overnight lows are typically in the 70s. At higher elevations on Maui (such as Haleakala) and the Big Island (Mauna Kea and Mauna Loa) it will be much colder. Daytime temperatures will be in the 50s with overnight lows in the 30s. Beginning in October, it is possible for some snow to fall above 12,000 feet on Mauna Kea and Mauna Loa. By November, larger surf episodes are starting to take place along north shores of the islands as storms in the north Pacific are getting strong and sending larger swells our way. OCEAN EDUCATION is a collaborative effort dedicated to promoting responsible stewardship of the environment, and the safe participation in ocean related activities and sports. This online education content provided by Action Sports Maui’s Ocean Education courses. “Ocean Education” & “Feed your brain” are trademarks of Action Sports Maui LLC. Content is protected by US and international copyright laws. This page and contents (unless otherwise credited) are Copyright © 2009- OE-Ocean Education, Action Sports Maui LLC, all rights reserved.